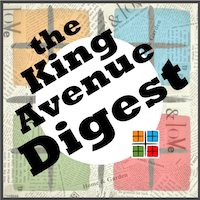 The King Avenue Digest highlights the biggest events and those that are most close at hand. Use the link below to view the full Digest for more comprehensive happenings organized by ministry/category that pertain to you. There are LOTS of events coming up in November, so check out the website to look ahead! DON'T FORGET TO SET YOUR CLOCKS BACK SATURDAY NIGHT! As we watch the news, we see the political environment becoming more hurtful every day. Our country has been enduring division, worry, and pain. Regardless of the outcome of the midterm elections, our country and community are in need of healing and reconciliation. Join your King Avenue family on Wednesday, November 8 at 7pm for a worship service. We will be praying for healing for our political divide, and wisdom for our country’s leaders and ourselves. All are welcome. King Avenue is much more than a place. It’s our home and our haven of blessing and peace. It’s where we grow spiritually, celebrate diversity, gather in unity, impact our community, enjoy time with friends and family, and make a joyful noise. Something magical and holy happens at King Avenue. It’s where we are all accepted for who we are, no questions asked, and no matter what troubles or worries we carry, we find fellowship and encouragement. It’s where we can regroup from the stresses of the world and remember that we are not alone. Like a family, we all join together to support one another. THANK YOU for your pledges and gifts in support of the King Avenue Operating Fund. Your gifts to King Avenue Church make it possible to change lives in our community and the world. You are a life-changer. We can’t thank you enough. Use the buttons below to help you make your pledge if you haven't already done so. Admission is free, but a $10 donation is encouraged. Our congregation will join organizations around the world in marking the 100th Anniversary of the end of World War I on Sunday, November 11, which is also Veterans’ Day in the United States. At 11:00 am, King Avenue UMC’s Carillonneur, Jeff Wyckoff, will lead us in Bells of Peace, tolling the church bells twenty-one times in coordination with chimes ringing all over the world. A witness from Judge Richard Frye will recount the powerful events our congregation experienced 100 years ago and the testament they left for generations when they commissioned the beautiful World War I Memorial window for the sanctuary. We will acknowledge our veterans and service members, pray for peace, and consider what spiritual lessons the past might offer us today. Angela Finney, our Church Historian, spent countless hours retrieving documents from our archives and from local news to help tell the story. You can view some of her research displayed in the hall next to the Chapel through the end of November. NNEMAP was selected with 9 other non-profits to compete for a top prize of $20,000 and a second place prize of $10,000! That prize money can do a lot of good for people in our community. Each of the 9 non-profits created a 60-second video on why we should win. You can view the video, but do not need to. This competition is about votes! And anyone and everyone can vote 4 times EACH DAY using your email, Facebook, Twitter, and Linkdin accounts. AND the voting will go on until Friday, November 9th! As of this posting, NNEMAP is nearly 2,000 votes ahead of the next agency. Keep up the good work! Vote early, and vote often! We will be holding a Church Conference on Tuesday, November 20 at 7pm in the Chapel. This annual meeting will welect 2019 church officers, review goals and membership, and set pastors' salaries. We shall also vote on the ministerial candidacy of Mark Beckett. Across the country, the people of The United Methodist Church are serving the people God loves in Jesus’ name. We’re doing it at home, but so often we’d like to do more. We want to serve those in other places who are suffering, and offer spiritual words of hope and life. Check out the Preaching Text page on our website for listing of the scriptures to be used in sermons. The next session of new member classes will take place during the 10am hour and will run from November 25 through December 16. If you are interested in joining King Ave UMC, or in just learning how to become more involved, email colleen@kingave.org. How can you tell if someone is a Methodist? No, this isn’t a joke. John Wesley believed that a person could spot a Methodist based on these five characteristics. Join us to learn what they are and how to live them out. No book or signup required. Pastor Colleen Ogle will lead a 10-week study beginning Wednesday October 10th from 7 to 8:30 PM. It is based on the book If The Church Were Christian: Rediscovering the Values of Jesus by Philip Gulley. Sunday School Hour at 10am – There’s Something for Everyone! Looking for ways for your family to serve at King Avenue? Ask Erin for more information and to get started! Would your family be interested in lighting a candle and reading an Advent scripture during this year’s Advent season? I will provide everything you need, so no preparation is necessary on your part. Click on the link below to sign up. All parents are welcome Sundays from 10:00-10:45am in the Fireside Room. Mark your calendars for October and November events! Stop by the Children & Youth Faith Formation Table on Sunday, November 25 to pick up your Family Advent Bag filled with devotions and activities for your family to celebrate Advent together in your home. Also, visit the ChristMission Tree in the Children’s Hallway (Lower Level) to pick up your tag for this year’s Advent Family Mission Project. Our mission project will benefit the YWCA Family Center. We've much to be thankful for. Join us for this King Avenue traditional meal following the 11:00 o'clock service. All are welcome around the harvest table! Please bring homemade pies for dessert. Please plan to join the King Avenue family as we gather to host this annual observation in the memory of those whose lives were lost in acts of anti-transgender violence. Join us for food, drink, and a lively discussion led by Reverand John Keeny at Braznehead in Grandview. Hope to see you there! RSVP in Facebook or Realm. Join us for our annual Friendsgiving dinner to give thanks among King Avenue friends, new and old. Sign up for taco fixings to bring by leaving a comment below. Mexican food is the theme again this year and dinner will be hosted by Darci Mossbarger at her home in Harrison West (address in Realm). Come enjoy this hidden treasure of the holiday season.The streets of German Village are lined with hundreds of luminaries. Take a walk with us and enjoy carolers, Christmas lights, and hot cocoa. We will meet at 5pm at the statue of Schiller in Schiller Park. Festive hats, scarves, and attire is encouraged! Second Sundays of the month at noon in Fellowship Hall. Contact Colleen Ogle for more information. Visit buckeyemethodists.com to keep up on all the latest events. KAUMC Hosts Hubbard Second Graders for Thanksgiving! 50 second graders from our partner school, Hubbard Elementary (CCS), will visit our church on Monday, November 19 for an hour of Thanksgiving activities and an early celebration of a Thanksgiving meal. We need volunteers to help with activities, serving food, hosting at table, and setting and cleaning up! If you are available to assist between the hours of 9am-1pm, there may be a shift for you! Please contact colleen@kingave.org to sign-up. This will be our first opportunity to host the children in our building. NNEMAP was selected with 9 other non-profits to compete for a top prize of $20,000 and a second place prize of $10,000! That prize money can do a lot of good for people in our community. Each of the 9 non-profits created a 60-second video on why we should win. You can view the video, but do not need to. This competition is about votes! And anyone and everyone can vote 4 times EACH DAY using your email, Facebook, Twitter, and Linkdin accounts. AND the voting will go on until Friday, November 9th! 4-5 volunteers serve food and wash dishes on the fourth and fifth Saturdays of every month from 8:30-10:00 at Gates Fourth UMC. Gates Fourth is located at 119 E Gates St, Columbus OH, 43206. The Cuisine For A Cause committee needs an additional member with some mild technical expertise. King Ave ClothesShare (boxes on the first floor) - Infant and Toddle Sizes passed down to other King Avenue families. All-church lunches are generally the last Sunday of the month in Fellowship Hall at noon. It is free to eat, but a free will offering is welcome. All are welcome to the table! After hosting the first Harmony for Hunger benefit concert in 2010, King Avenue UMC is pleased to be hosting this year’s concert on Friday, November 16 at 7:30 PM. The concert benefits NNEMAP, and features musicians from many of the churches that support the food pantry. Each year’s event provides much-needed funding during the busy holiday season. Tickets are only $20.00 and will be available for purchase following Sunday worship services in November. We hope to see you there! The theme of the sanctuary decorations this December is “The Colors of Christmas.” We would like to carry that into the gallery. Bring a colorful ornament! Also if you have a favorite holiday photo, make a copy and clip it to the roping. At the end of December we would like to keep all the ornaments and photos and make a huge wreath that we can display for years to come. We’re kicking off Advent by making Chrismons, ornaments made from Christian symbols. The class will be led by educator and artist extraordinaire, Kurt Reichert. The class is free and you get to take home your very own ornament. Ages 11 and up. For this and other King Avenue news, visit our website at kingave.org.